In 2007, Filcon Construction was honored to be apart of the Extreme Home Makeover for the Hughes Family. 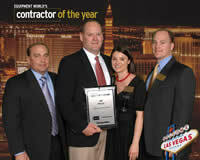 In 2008, Tim Filiatreau owner-operator, was nominated for Equipment World Magazines' Contractor of the Year. He was one of the twelve finalists featured in Equipment World Magazine. The finalists were awarded in Las Vegas. We became State Qualified in 2008. In 2009 Filcon played a major roll in the REVIVE I65 project in Louisville, KY.
Filcon Construction has completed work with Hall Contracting on the Watterson Expressway/ Westport Road Interchange Project in Louisville, KY.
North Wilson Road as prime contractor for the City Of Radcliff located in Hardin County Ky.
Interstate 64 in association with Louisville Paving for Kentucky Transportation Cabinet located in Shelby County Ky. Developments such as: North English Station, Avalon Springs, Riverport Landings, Brentwood Subdivision and Bristol Bluff Apts. Filcon Construction is also anticipating starting several other projects early this year!